Recently I traveled to Las Vegas for a bachelor party and every time I go it is always a completely different experience from my previous visits. The city has evolved quite rapidly from my first visit almost 10 years ago and what has fascinated me about the place is that this city has consistently been one of the most visited cities in the USA over the last 40 years and throughout this time frame it has successfully shifted the demographic to which it caters its message many times. Just as companies compete for the affection and portion of customer’s wallets , so do cities, regions, and nations compete for visitors or residents to come and spend their money. In examining areas around the globe, it is readily visible that some are very successful at conveying their message, while others are not quite so. How has Las Vegas done this successfully while other cities (such as Toronto) fail to establish a brand with a consistent message? Las Vegas has been built on casinos and gambling, and has had a mystique for visitors as a place where anything can happen. 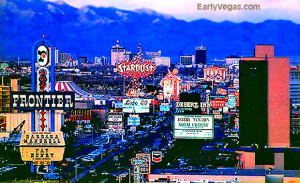 Until the end of the 1980’s, Vegas was essentially a place to escape one’s reality and do things that one cannot do back home. Sin City. In the early 1990’s however, resort operators saw an opportunity to target an untapped market: families. The result: many family-themed resorts opened up with water and theme parks, along with kid-friendly shows and entertainment. Las Vegas transformed into a place where a family could have fun at every opportunity and in every which way. Despite the shift to a very different target audience, tourism continued to boom, reaching 36 million visitors per year by the year 2000, up 53% from 1993. Nevertheless, at issue was the fact that these families were not spending money gambling – the fundamental activity that was funding Las Vegas. 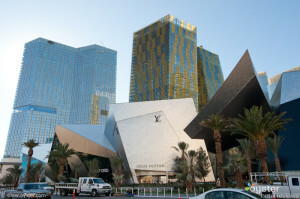 As a result, resorts began to shift away from the family theme and focus on the “Adult Playground”, developing the tagline “What happens in Vegas stays in Vegas”. Importantly, this shift did not involve reverting back to the days of Sin City, as the focus now includes lavish parties, fine dining and extravagant shows, as well as gambling. 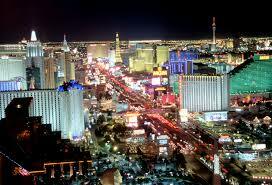 Las Vegas is now more than just a place for sin, it is a place of extravagance and opulence. Throughout these three phases of Las Vegas’ past, it seems as though the method of delivery and the catered audience has changed over time. So how has this not created confusion for tourists that visit? Well, at its core, Las Vegas has always been able to do one thing better than any other city in the Western Hemisphere: provide everything in excess. Whether it’s gambling and prostitution, theme parks and playgrounds, or pool parties and fine dining, Las Vegas has always delivered in excess – they provide more of everything than anyone else. Further, Las Vegas does not deliver conflicting messages, trying to be all things to all people in its advertising. When the tagline “What happens in Vegas stays in Vegas” was adopted, this message transcended all forms of media including: commercials, billboards, travel magazines, movies (The Hangover), blogs, and editorials. What Can Places Learn From Las Vegas? 1) It has a unique value proposition that goes beyond the services they deliver. Las Vegas is no longer simply a gambling town, or family vacation spot, or an adult playground – it is a city that represents excess. 2) It delivers one consistent message to its audience and does not try to cater to multiple customer groups at a time. When Las Vegas focused on families, they focused on families, and when they wanted to deliver the “Adult Playground” message, they focused on solely that message. 3) A high degree of cooperation exists between the major stakeholders in the tourism industry (resort operators, municipal and state government) in order to ensure consistent delivery of the value proposition with the customer at every interaction point. 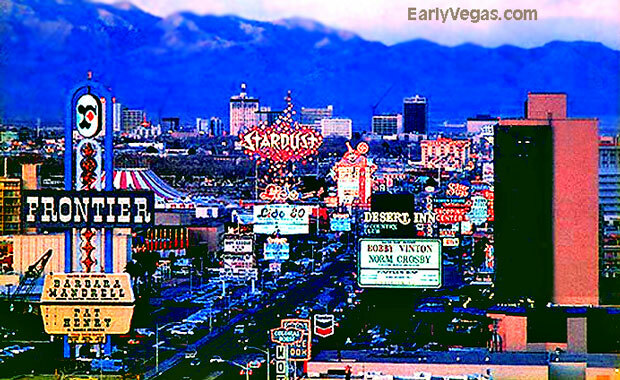 In my next post I will examine a city that has struggled to forge an identity and provide some ideas as to how it can begin to showcase itself using the template provided by Las Vegas. In the meantime, what are your thoughts on the Las Vegas brand? Are there other cities that come to mind that have been even more successful at branding themselves? McCallister, Eden, “The Shifting of the Las Vegas Tourism Industry: A Historical Perspective on Management and Resort Revenues” (2012). UNLV Theses/Dissertations/Professional Papers/Capstones. Paper 1472. Akinsete, Joseph, “Las Vegas visitor demographics: Be Careful what you wish for” (2010). UNLV Theses/Dissertations/Profeffional Papers/Capstones. Paper 594. While studying in Milan, I took a course that examined how psychological research can be better applied in marketing products and services more effectively and one particular lecture that caught my attention discussed how humour impacts marketing. After taking some time to let the course material sink in, I’ve realized how important humour is in advertising campaigns today. 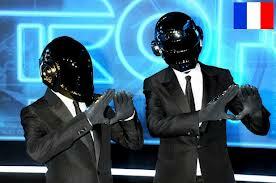 Just think about the Superbowl commercial phenomenon. Every year, people look forward to the Superbowl, in part, to watch the new commercials that are presented. The ad spots up for grabs during the Superbowl are some of the most expensive to purchase, going for as much as $4 million for a 30 second spot, and it is no coincidence that many brands choose to showcase their product using humour. Here is an example of my favorite Superbowl ad of all time, where a company employees a football linebacker to enforce office rules. Viewing advertisements is a lot like dating, in that while we watch the ads, we are analyzing it to see if the brand would make a good addition to our lives. When looking for the right partner, often times, people say that they would like a partner that makes them laugh and finds humour in the same things. Companies are always vying for our attention and love, and they too have realized that the key to the customer’s heart is through comedy. So if humour is a useful tool that can be used in advertising to attract the customer, how does one succeed at making a funny advertising campaign? Before we can begin to understand how humour can be used successfully to appeal to customers, let’s talk about what humour really is. 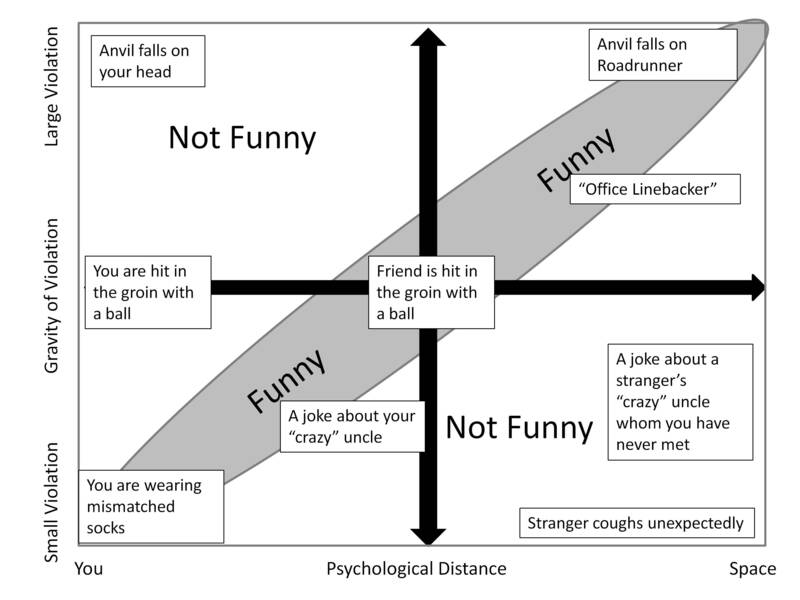 While there are many theories, the increasingly popular (among scholars) Benign Violation Theory (BVT) states that something is funny if it threatens one’s sense of how things should be (violation), without being harmful (benign). Using my office linebacker example above, it is pretty obvious that the violation is the linebacker in an office setting however, deciphering whether the violation is benign may be a little more complex. While some people may find the situation funny because they do not know the people getting tackled and because it is not real, to others, this may be seen as offensive and too violent for some viewers to be watching (along with Terry Tate’s language which may not be considered appropriate). This is where the viewer’s psychological distance to the situation that is unfolding comes into play. The further away the violation is to the viewer, the more benign the situation becomes, whereas the closer the violation to the viewer, the more severe the situation is. As an example, consider an anvil dropping on a cartoon character’s head, versus an anvil dropping on your head (or you getting tackled by a linebacker in your office). The first situation is very far removed from your life and from real-life in general, therefore can be considered quite benign; yet is still a violation of what is perceived as normal. In the second situation, the violation is not benign at all because it is something very painful happening to you! 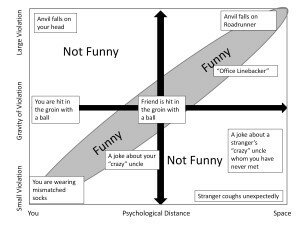 Psychological distance also plays a role in how severe the violation can be in order for it to be humourous. What this means is that the more distant the violation is to you, the more benign it will seem, to the point where it may not even register as a violation at all. Therefore, in order for a situation to be funny, it needs to have a specific psychological distance from the viewer, depending on the gravity of the violation, in order to be a benign violation and hence, funny. What is interesting to note is that determining whether a situation is a benign violation depends on the viewpoint of the person witnessing the violation. Hence, just as how jokes about “that time in Vegas” are far more successful when told to your friends as opposed to your date, creating a funny ad depends on who the audience is and how you wish to present yourself to them. Therefore the key to making a humourous ad requires depicting a benign violation that not only showcases the value proposition of the brand, but appeals to the specific customer group being targeted with the ad. A recent example of how humour in an advertisement has successfully applied these concepts is the new FIAT commercial, which shows a young couple purchasing a FIAT that comes with a family of (3) Italians. This ad displays a situation that is inoffensive, but still quite a departure from what would normally occur when purchasing a vehicle. It highlights the target audience (25-40 year olds) through the purchasers of the vehicle and directly addresses a potential issue of the car being too small, through the deployment of three adult Italians sitting (relatively) comfortably in the back of the automobile, and several subsequent humorous adventures. Finally, the advertisement helps showcase what FIAT hopes its vehicles will be known for: being fun, and stylish. To sum it all up, humour is a very successful tool that can be used to attract customers to your brand; however in order to successfully execute a funny ad, it must be a benign violation in the eyes of the customer group in which you wish to target, while still having the desired effects of educating customers about what your brand represents. Therefore, unless you think your date would be totally cool with it, while successfully communicating what you, as both a person and a brand represent, do not tell her about that “wedding you had in Vegas with the bartender 20 minutes after you met her” story. Tim Hortons recently launched the “Maple Flatbread Breakfast Panini”, the latest in their “Panini” line, and another example of Tim Hortons foray into the premium cafe segment. While I applaud Tim Hortons efforts to attract a new customer segment, I find that this approach will only serve to confuse their existing customers. 1) Since when did the term “Panini” stand for a grilled sandwich on toast bread? Panini is actually the plural term in Italian for a sandwich (singular being panino). I am of the firm belief that if you want to present a foreign name for a product, than you should use the correct foreign name. While using the plural term for a singular product isn’t as bad as some of these other foreign branding mistakes, given Canada’s large Italian population, I think Tim Hortons can do better. 2) The “Maple Flatbread Breakfast Panini” is simply too long of a name for a sandwich! Can you imagine someone actually saying the whole name of this product while ordering? Tim Hortons has employed a layered naming policy wherein product descriptors are used in the name to classify where the product exists among Tim Hortons naming hierarchy (i.e Breakfast means that it is offered from 5am-12pm on weekdays and all day on weekends). I agree that product names should convey what the product is offering, however it should also be as short as possible! Tim Hortons’ growth has slowed in Canada as a result of increased competition from McDonald’s and their poor performance in the U.S. As a result, Tim Hortons has chosen to evolve through the launch of their line of “paninis” and other premium products such as espressos and lattes in order to cater to a more upscale clientele. The issue I have is that Tim Hortons continues to market themselves as the traditional “Canadian Doughnut Shop” and the coffee of hockey families, while at the same time trying to cater to a more upscale urban clientele, causing confusion in their message and potential long term damage to their brand. I do think that the expansion of their food offerings may definitely be a great tool to reverse their recent performance; however I think they can do so by leveraging their strong association with the Canadian lifestyle when naming their grilled sandwiches as opposed to calling them “Panini”. They might also want to consider simplifying their naming conventions so as to keep the customer in mind. Do you think Tim Hortons’ strategy of offering premium products such as Panini will be successful? The wheels in my head are always turning and I am constantly looking for new ways to share my ideas and thoughts with others in order to gain further insight or perhaps even provide inspiration. Starting a blog seems like the best way to do this on a large scale and encourage larger discussions with all of you! As you can see from my bio, my background is focused on Marketing and Strategy, and that is where I will primarily be writing about, however I may sneak in a few non-related rants now and again. More specifically, I enjoy examining the interaction between the buyer and seller of goods and services and how this differs depending on the type of vendor, consumer, and cultural influences impacting the two. By no means will this site be confined solely to business interactions as I believe that businesses can learn a lot about social interactions between a buyer and a seller (i.e a guy asking a girl out on a date), and vice versa. This blog definitely is not intended to be a lecture, and so I encourage you to comment and post whether you agree, disagree, possible alternative viewpoints and so forth. My goal is to have a forum where we can exchange ideas and learn from one another. So, welcome to my blog and I hope to hear from you!